Wheel Diameter 18" 18" ​8"
Raised Lip Height 72" 67" 59"
Lowered Lip Height 40" 39" 42"
Curb Heights 8" 8" ​8"
Our commonly stocked widths are 70" and 84" wide, both of these widths are ideal for almost all over the road LTL trailers. If your application is for an open dock, railcar, or loading dock door you may want a wider ramp; in these cases your Yard ramp can be ordered at specified widths. Note: Ramps over 10' wide will be split into two sections (these will require onsite welding by a certified welder). While we typically do not recommend making your ramp at a width wider than your opening size we do have several options that will help accomodate this need please Call 1800-741-1258 to find out more about these options. What is the smallest and largest width of trailers to be serviced? Are there pallets placed or removed near the opening? Will the entire width of the trailer opening be required for unloading? ​​In diagram 1, to the right, an 8'6" wide LTL truck opening is depicted with a 70" wide yard ramp on the left and an 84" model on the right. The opening size of an 8'6" trailer is commonly 93". 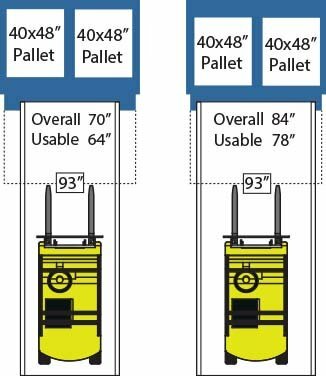 Note how the 70" wide yard ramp does not take up enough of the opening to allow easy access to both pallets without repositioning, whereas the 84" model is capable of reaching both pallets without repositioning. ​​To ensure your ramp will operate as intended, without premature dishing (warping) from stress and heavy loads, we use a simple calculation that takes into consideration the load weight dispersed between four wheeled and three wheeled forklifts. If you intend to operate the ramp in excess of 8 hours a day or are using specialized equipment we recommend calling 1800-741-1258 or submitting a request for information for additional support in your selection. The 6' level off on the 36' ramp model is ideal for use with trucks and other low clearance door ways. The benefit of the level off comes from the ease of loading and unloading the rear of the trailer; it also serves to improve movement into and out of the trailer. For permanent and semi permanent dock to ground applications we offer the 30' all incline model. This model should not be used for truck to ground loading. 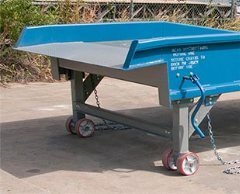 Our standard yard ramp models are built with hydraulic steel undercarriages designed to raise the ramp up to dock or truck level. The undercarriages solid rubber tires also make movement of the ramp across short distances exceptionally easy. 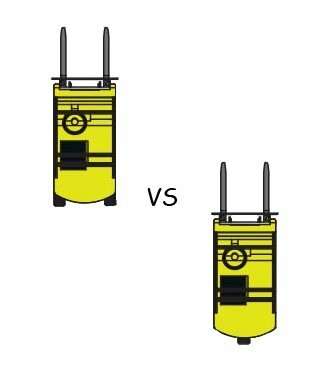 To raise the undrecarriage a double-acting hydraulic pump is accessible through a convenient hole in the deck grating. This makes inserting and operating the removable arm a hassle free operation. Note: The stock yard ramp tires are not suitable for use on loose gravel substrates for these applications we offer optional pneumatic tires (air-filled). 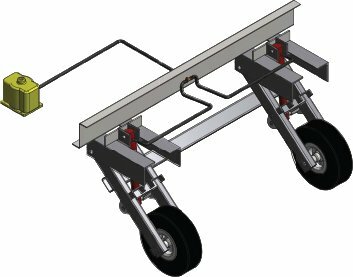 ​If you would rather use a adjustable legs rather than an undercarriage to raise and lower your ramp our caster models make for an ideal choice. Designed with 8" caster wheels for ease of movement, this model effortlessly moves across concrete surfaces. Ask a sales rep about this option.